Kasie Swain is living the American dream, now owning and running the beloved local diner where she worked for decades. “Doesn’t everybody who loves their job think that maybe they’ll eventually buy the company?” she says of her fairy tale story. Kasie’s business partner is son-in-law Ben Zook. Both enjoy waiting tables, infusing the dining room and patio with “old school” service. She does all of the baking (her carrot cake, shown above right, is a favorite) and makes many of the soups, sides and dressings. Ben handles the accounting and marketing. Since taking over, the two have redone the bar area and updated the kitchen, obtained a liquor license and started opening for dinner Thursday through Saturday. “Our customer base had been asking us for years to do dinner again,” Kasie says. Mountain Shadows is famous for great service in a homey atmosphere, breakfast-all-day, generous portions and delicious green chili, made fresh every few days and sold by the jar for take-out. “Our food is one of those cases where less is more: very simple, very good, with lots and lots of flavor,” Kasie says. The top item on the new night menu is the rib-eye steak from Ranch Foods Direct. Kasie was sold after doing a taste test with a commodity steak. “The taste was night-and-day. 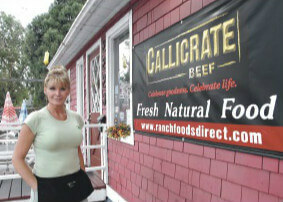 I never realized until then how different the Ranch Foods Direct beef would taste,” she enthuses. Another big seller: the Callicrate burgers. “We sell tons of them and everyone loves them. We do all kinds of things with them, including a patty melt and a slopper with green chili.” Buffalo from Ranch Foods Direct is also popular, especially the buffalo chopped steak on the dinner menu.